The Grand Ivy Casino is one of the newest NetEnt casinos that are operated by Imperium Network Solutions Limited which belongs to the reputable Caddell Group. The Caddell Group is licensed with the UK Gambling Commission, and also has many other casinos which are part of the group, such as: Slot Planet Casino, 21 Casino, 21 Prive Casino, and GDay Casino. The Grand Ivy Casino offers players a top VIP gaming experience, with over 600 games to choose, you will no doubt have hours of gaming fun. There are slots from various gaming giants, such as NetEnt, Amaya slots, NYX games and Leander games to ensure that you are lavishly spoilt for choice. If you are a new player at the Grand Ivy Casino, you are eligible to collect 20 No deposit bonus spins on any NetEnt Slot that you like. The process is simple. 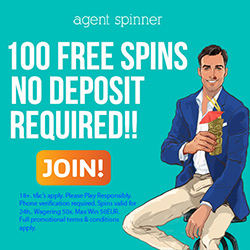 Sign up for an account, open up any NetEnt slot and you will find your 20 bonus spins waiting for you. Make a minimum deposit of €/$20 to qualify for your welcome bonus offers. Make a minimum deposit of £20 to qualify for your welcome bonus offers. New players only. Players must be 18 years or older. Full terms and conditions apply. Click here. BeGambleAware. Winnings from your 20 No Deposit bonus spins carries a 35x wagering requirement which must be fulfilled before cashing out. The maximum withdrawal limit for any winnings on your 20 No deposit bonus spins is £50. Winnings from bonus spins are capped at €/£/$100. You must deposit a minimum of €/£/$20 to be eligible for the Welcome offer. The following players are restricted from playing at Grand Ivy Casino: Afghanistan, Albania, Algeria, American Samoa, Angola, Australia, Austria, Belgium, Bolivia, Bulgaria, Cuba, Denmark, Ecuador, Estonia, Ethiopia, France, Ghana, Guam, Guyana, Hungary, Indonesia, Iran, Iraq, Israel, Italy, Kenya, Lao Peoples Democratic Republic, Latvia, Lithuania, Malta, Myanmar, Nigeria, North Korea, Northern Mariana Islands, Pakistan, Panama, Papua New Guinea, Poland, Réunion, Romania, Russia, Sao Tome and Principe, Singapore, Slovenia, South Africa, Spain, Sri Lanka, Sudan, Syria, Tanzania, Thailand, Turkey, Uganda, Ukraine, United States, United States Minor Outlying Islands, Vietnam, Virgin Islands (U.S.), Yemen, Zimbabwe. Note that you will have to wager 175 times in the following games when playing with bonus money: Dead or Alive, Lucky 8 Line, Magic Love, Gold Rush, Kings of Chicago, Jackpot 6000, Pirate’s Gold, Blood Suckers, Mega Joker, Devils Delight, Safari Madness, Super Nudge 6000, and Beetle Frenzy. The deposit options at Grand Ivy Casino are: MasterCard, Visa, Sofort, Trustly, Paysafecard, dotpay, Bank Wire, Neteller, Giropay, Skrill, POLi, Interac Online, and Visa Electron. Note that cash out times vary depending on the withdrawal method that is used. E-wallets take up to 24 hours, Credit/Debit cards 2 – 5 business days, and Bank transfers take 2 – 7 business days. The pending period may take 48 – 72 hours. You can deposit using the following currencies: USD, EUR, GBP, and CAD.